"Kirchner's art is - like Picasso's - eminently autobiographical." In other words, the intention and form of Kirchner's art are so deeply rooted in reality, yet his life was such a dramatic reaction to critical upheavals, that one can conclude: few artists yield so much of themselves that their work could be described as the focus of an epoch. At the end of the century we can take Kirchner as an example to make a film about the beginning of the century. No one succumbs to the city as fully as he did: enamored, lonely, swept off his feet, lost, disillusioned, fascinated. Berlin is Kirchner's city. His streetscapes are considered the culmination of his work. They are a highlight of the history of modern painting and the backdrop in our mind's eye when we seek to capture big-city life in the first half of the century. Kirchner is the unvarnished perception of modern life. It hits him in the eye, he reacts, he seeks a form: size, speed, machine, man-eating monster, whore, crowds, razzle dazzle, synchronization of sensations, surrender to the show: cabaret, dance, circus. Kirchner's art begins in Dresden and the Moritzburg ponds. Berlin is his urban awakening. The war crushes him. He retreats to the Swiss mountains. 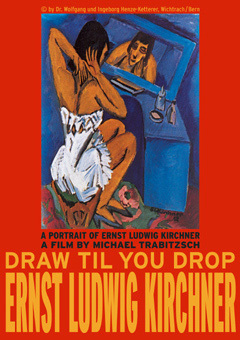 The span of tension in Kirchner's life and work makes for suspense-filled drama and yields an intense film portrayal. Michael Trabitzsch was born in 1954 in Neumuenster and studied German Literature, Philosophy and Sociology in Goettingen and Berlin. He has worked as a freelance journalist and author for radio-features, documentaries, books and periodicals. From 1987-1991, he worked as an assistant director and assistant producer for Harun Farocki. In 1992, he founded Prounen Film in Berlin. His films include: A Quiet Rebel. The Sculptor Wieland Foerster (short, 1992), District of the Refugees. A Journey into Jewish Paris (1993), Defenseless Hero. The Sculptor Werner Stoetzer (1995), The Eisenfeld Family. A Chronicle (1995), The Stones Still Speak (1996), From Thessaloniki to Berlin via Auschwitz (1998), The Marble Road (2001), and Draw Til You Drop - The Painter Ernst Ludwig Kirchner (Zeichnen bis zur Raserei - Der Maler Ernst Ludwig Kirchner, 2001).